A two day raid by the German Luftwaffe flattened almost the entire town of Clydebank after it was bombed in the blitz leaving thousands homeless and more than 500 people dead. 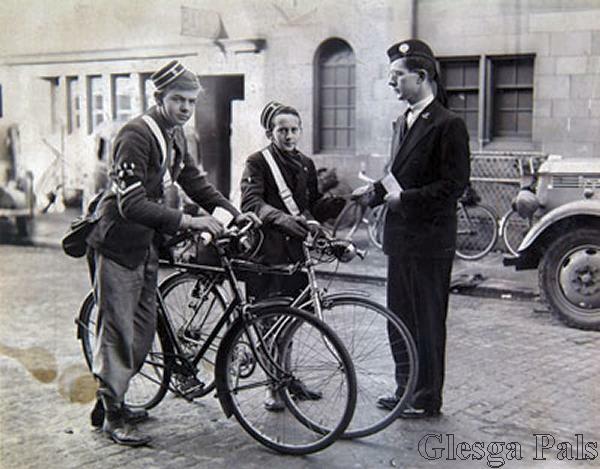 These two Boys Brigade members and their bikes are seen here receiving orders from their BB officer before cycling through the devastated streets to pass on information. This photo is in the book "After fifty years: 1st Bearsden Company, The Boy's Brigade, 1898-1948"
The Officer in the photo is my father, James Stevenson Scobbie (1920-1995), from Manse Road, Bearsden, Glasgow. He was probably a medical student at Glasgow University at the time of the photo.